It does not take that sophisticated technology to hunt Japanese subs. They are so noisy that they irritate whales nearby. So if you find agitated whales, see if there’s a Japanese whaling ship nearby. If there is none, then there must be a Japanese sub nearby. What would the Japs expect from old technology? The Soryu-class is an excellent submarine . . . compared to American standard. But the Japanese subs was never know to perform better to Russian subs, and Chinese sub technology was based on the Russian with significant improvement that even the Russian was impressed. This is a proof of how small the Japs thinks the world of. Of course if the Japs think ‘the world’ as in Western world, it is very small. After all, we all are aliens on what the West perceives as ‘the world’ as we live outside their sphere of influence. In any case, it is very simple for the Japs to test their subs capabilities. Try to surface undetected in the middle of American battlegroups. Chinese subs often do that for fun, scaring the American. If the could do just that, then they can test their skills on the better navy. In the meantime, the Japanese navy is better to stick to what they did best, monitoring and hunting kaiju. Obama gazzumped the deal on the 11th hour telling Ozzies that they can buy from the French instead of the Japs who were not told anything. Even the media knew about it before the Japanese government and was a great loss of face for the Japs. The Jap was so paranoid of the Chinese that when they invite journalists to show their low tech frigates in Australia, they were shocked when Chinese journalists were among those who showed up. In the end they turned away everyone that were Chinese, be it journalist or tech crews. Even the Chinese Australians working for Australian media crews, for ‘security reason’. More like Japs forcing Australians to submit to their interest, sound familiar? WW2? China would never impose such conditions restricting American or Japanese Australians. Chinese Australians are major contributers of the Australian economy. It would not surprsie me if that was a factor in the Jap sub deal being dropped. Underneath the politeness the Japanese are inscrupulous arrogant bunch of goons. Actually, it’s common practise for the Chinese Navy to prevent Japanese sailors boarding any of the Chinese warships during an open tour. Recently, at RIMPAC there was a sting between Japanese sailors visiting Chinese warships. A Chinese sailor on duty politely asked a Japanese sailor to ‘get lost’ when the Jap sailor was already on top of the gangway. There was s short article of the incident by an American writer. The writer wrote a negative view on the PLAN’s not so friendly hospitality. When U think of it, it’s correct since Japan refused to repent of the China genocide in WW11, the Diaoyu island stolen from China, the extended Japanese ADIZ before China established it’s ADIZ and the problems Japan is stirring up in the SCS. 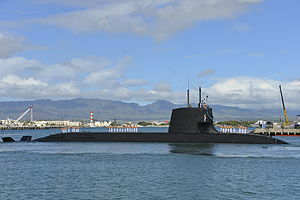 The Jap sub Soryu class lost out big time in a $50 billion dealt to the French Shortfin Barracuda to replace the Australian navy subs. The Australians must have got the tip off from the Americans that the Chinese can easily detect the Jab subs and that they are, excuse the pun, sub par. Like with the Phillipines the Americans are’nt exactly friends wit the the Japanese but just using them as pawns in their containment of China and Russia. They don’t like any of its so call allies which the yanks has a master and slave relationship, to exert any geopolitical leverage of their own. The Americans did interfer with the Australian submarine deal with Japan by expressing concerns. Its quite incredible, the Soryu Sub switched off radio and active sonar, yet was detected All along. This means the Jap submarines are losing its edge big time. This should include the US subs, French Barracude. Damn Sushi Subs Soaking in contamination and Salmonella.